Ultra realistic car, 100% fully mesh in high quality, 100% materials! ultra realistic baked textures and shadows. 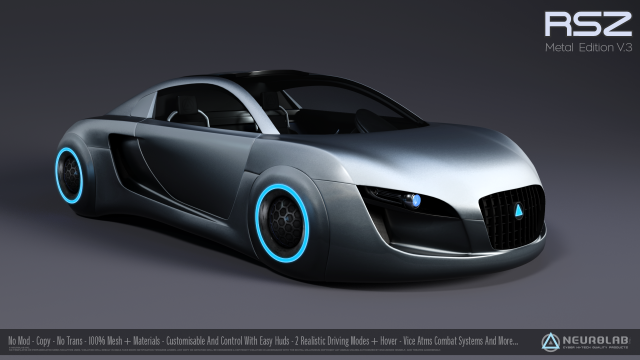 – includes new smart hud for complete customization! many choices of features to make your car unique! – you can customize the lights independently of wheels, headlights, instrument panel and monitor, by choosing your color, glow and shine. • Realistic fx: real lights with projectors, weapons effects..
– Exclusive scripts! not full perm or prefabs scripts! 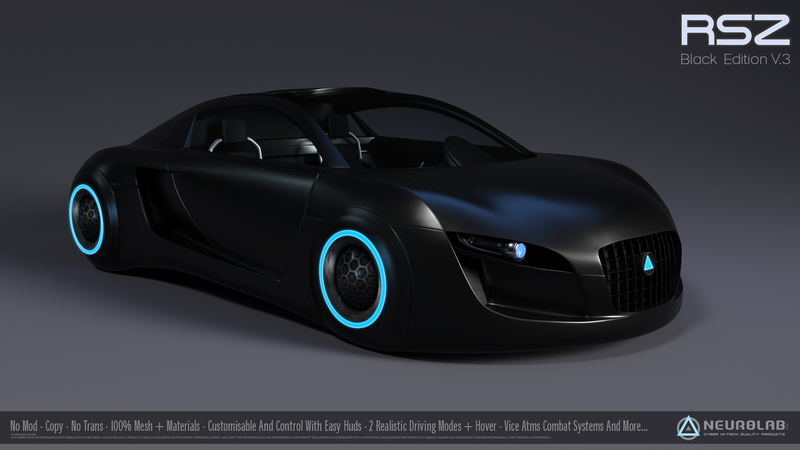 – You can customize the lights independently of wheels, lights, instrument panel and body for color-able version, by choosing your color, glow and shine for each part. – Change the shine of the car body. 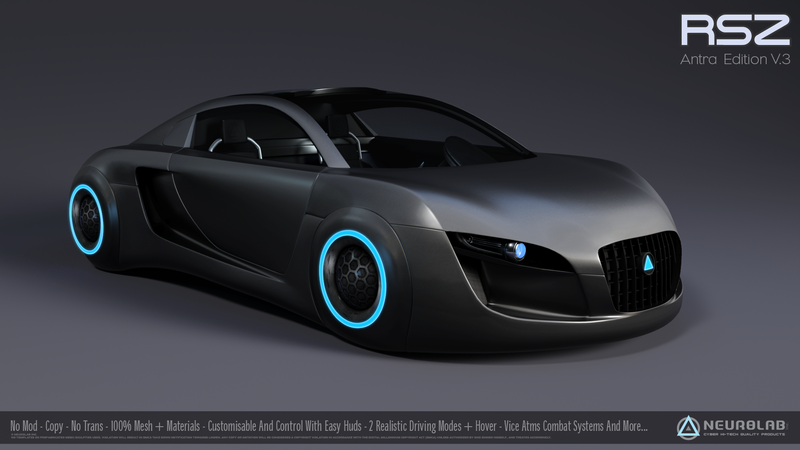 – Turn on/off lights and more..
– Change transmission mode (manual/auto). – Select and Rez Multi Custom Engines Button (Owner version). – Change Camera View (three pre-sets locked and Dynamics). – Car Setting menu button. – Speedometer display (graphical and numeric) and current gear. – Switch to all Driving mode. 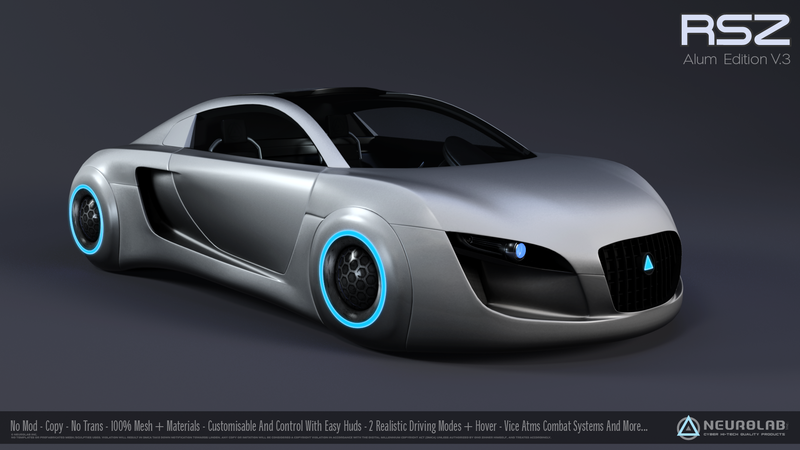 – This HUD stores Sit position and wheel position/size you make in the menu to suit your avatar. – Work also for passengers. – 2 version: Owner and free users. 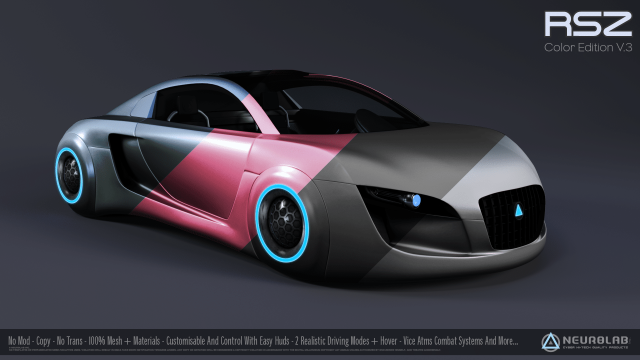 • 1 CAR (100% Mesh). • 1 HUD Driving free public. • Left mouse button or Double Tap Arrow key up (W) = activate Turbo. [ Owner Only ] = When not allowing anyone else to ride the car. [ Group Only ] = To be ridden by group members only. [ Free ] = For anyone to have a go! – Drop car to the ground. – Wear Custom SMART HUD, Connect, and change colors and others things to your car. – Take car in inventory. – Drop HUD Driving (Owner) to the ground, delete car under content, and drag your car custom. • Wear the RSZ HUD Driving, click to SELECT button, choose combat or no combat version and rez the car. • Push left or right arrows for turn. • Push up or down arrows for accelerate and brake. • Push Page or and down for change altitude. • Set Combat mode to ON on the HUD. • type M and [enter] to local chat for launch guided missile. • left click mouse for use cannons. 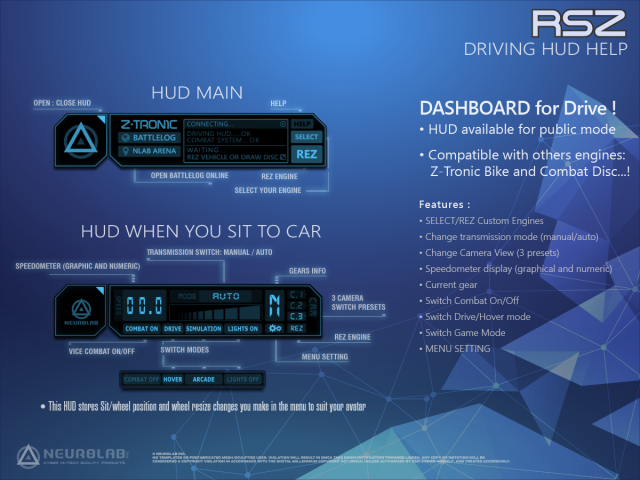 ■ Driving HUD: Added Select Rez button (manage multi custom engines). one object in its content. – the new one, named “SELECT” allows you to select which object you want to rezz. Combat and no Combat version and more..
– Driving HUD: Added Select Rez button (manage multi custom engines).